This is the time of the year that I am desperate for new and exciting projects for the kiddos to do. We generally do a lot of painting and art projects to beat cabin fever. 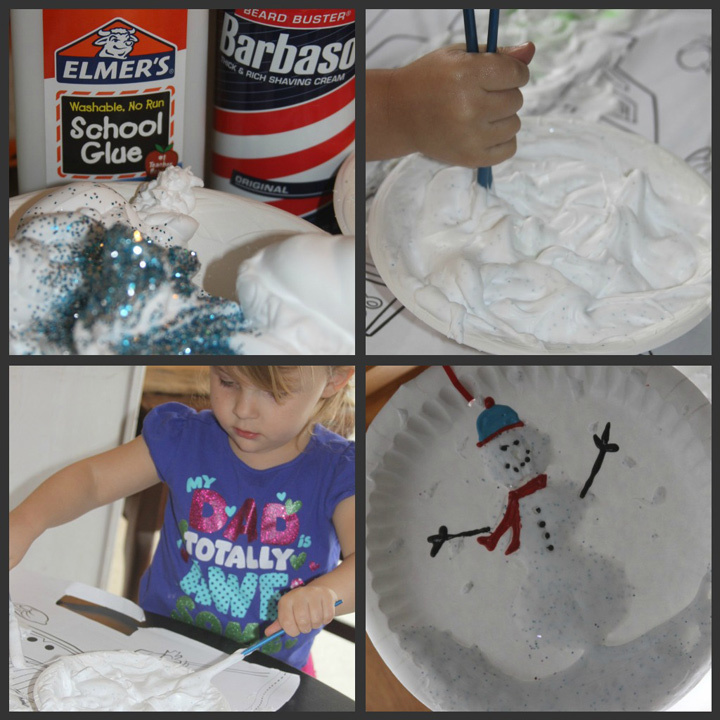 This snow paint will keep your kids busy for a long time and you will have some fun creative art to hang up this winter. It’s really inexpensive to make and super simple too. Busy kids are happy kids, right? The longer we are stuck inside during the winter months the more the kids seem to start driving each other crazy. 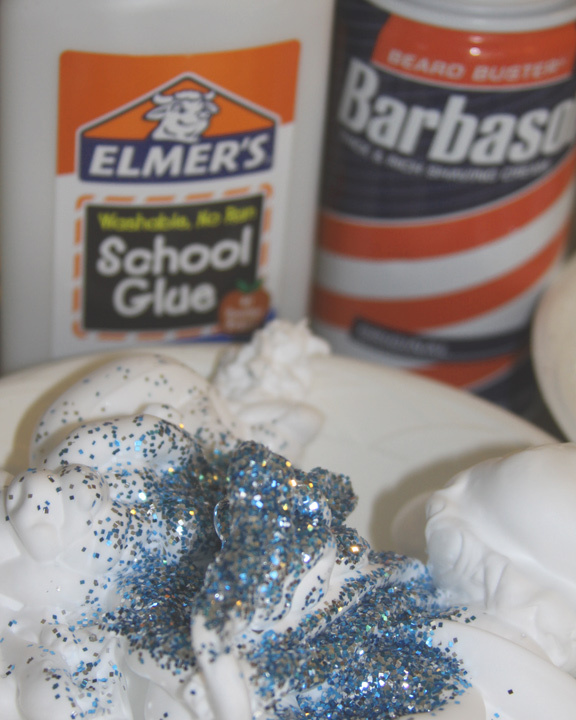 I have a list of fun projects to do with the kids this winter. 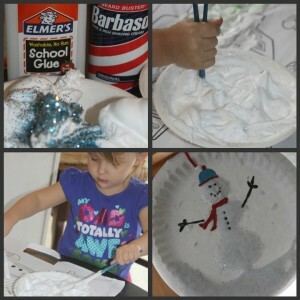 I love Pinterest for organizing projects and ideas for winter fun. I have a board that is dedicated to things to occupy the kids. That where I first saw this snow paint. I added a little sparkle to make it extra exciting for the kids. Sprinkle in Blue Glitter and mix - It will be much more visible after the snow paint dries so you don't need to add as much as you think. 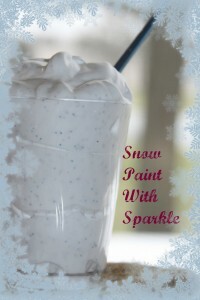 To celebrate a major snowfall yesterday we broke out the snow paint and got busy creating. This stuff is so fun to paint with, and kept my kids busy for over an hour. They couldn’t wait for the “snow” to dry so they could see their finished projects. This paint dries in a cool 3D manner and looks really neat on paper with the glitter showing through. Although when you first add the glitter, you don’t really even see it, as soon as the paint dries the glitter shines right through. 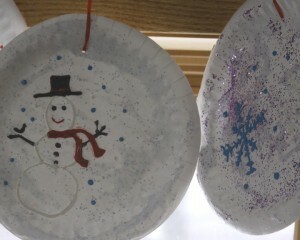 We decided to paint some white paper plates or “snowflakes” to hang throughout the house for the winter. Once the paint had dried on the paper plates we had another fun idea to break out the puffy paints and make snowmen out of our snow art. I painted a snowman for each child out of the snow paint and after it dried the kids could use the puffy paint to add hats, scarves, faces, and more. They were simply thrilled with the idea of dressing up their snowmen with puffy paint. The kids thoroughly enjoyed this painting project, and so did I. They are so proud to have their creations hanging around the house! Between painting with snow paint and playing out in the fresh fluffy snow, I had two very tired kiddos yesterday. We had so much fun, and stayed so busy that there was no time for cabin fever to set in.